Whether North Pole, South Pole or deserts - most remote regions of the world have one thing in common: their wealth of mineral resources. That makes construction sites in sandy wastelands or perpetual ice highly attractive economically. But architecture must cope with a glaring lack of infrastructure in addition to the climatic challenges. These three examples show that it can succeed very well. With an annual precipitation of a maximum of 75 millimeters, the Chilean Atacama Desert is one of the driest regions on earth. The copper mine Ministro Hales is located in the middle of this desert wasteland. Large temperature differences between day and night, as well as extreme wind, make life and work here difficult. Building is also a challenge. The "Centro Integrado de Operaciones", a 4,800 square meter administrative and social complex, was constructed in 2014 by the architectural firm of COXARQ Arquitectos from Santiago de Chile. Four buildings with inner courtyards provide employees the comfort of an open-plan, modern office building - and protection against heat, cold, wind and sand. The facade, made of copper-colored corten steel and glass, not only takes the extreme climatic conditions into account. Lighting, color and geometry of the complex also aesthetically blend with the desert landscape. Lee Sang Leem is convinced: Nature created the Antarctic for eternity, not for people. 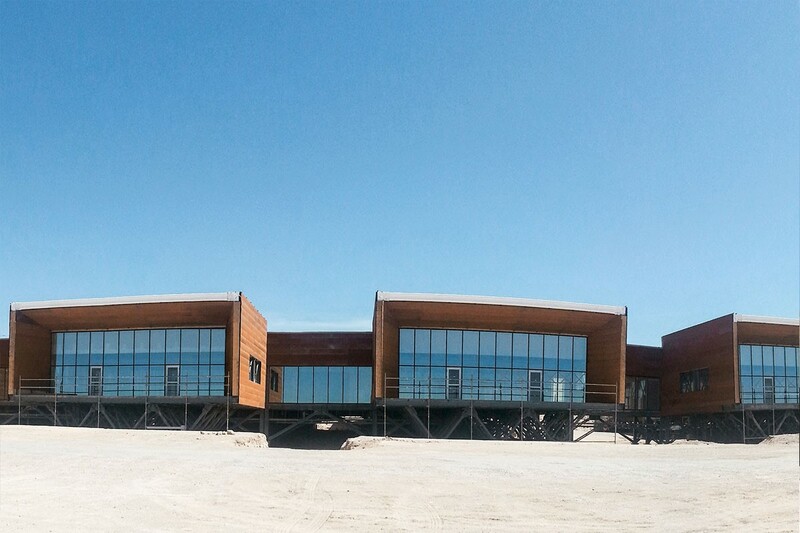 Nevertheless, the South Korean architect from SPACE Group accepted the order to construct the Jang Bogo Antarctic research station. This research institute, in the bay of Terra Nova, has been withstanding temperatures up to minus 40 degrees Celsius and wind speeds of up to 234km/h since the beginning of 2014. Scientists test devices, equipment and new materials there under extreme conditions. The center was built in a modular form during two consecutive summers - of only 65 days at a time. 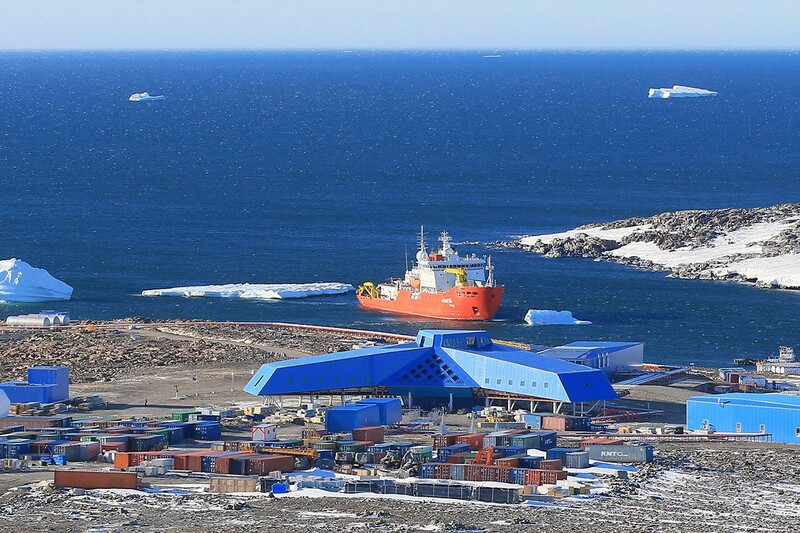 Prefabricated components and equipment were brought to the destination using icebreakers. The aero-dynamic, three-arm structure of the main building offers the wind very little exposure. The buildings are raised and have only few points of contact with the ground. Sloping walls and roofs minimize contact with ice and snow. Stainless steel protects the foundations and parts of the building close to the ground against condensation. Thanks to outstanding insulation, a constant temperature of 20 degrees Celsius and a relative humidity of 40 per cent prevail in the interiors. According to estimates from the US Geological Survey, about 13 percent of all oil reserves and 30 per cent of the gas reserves are located around the North Pole. However, the infrastructure for their development still has to be built. 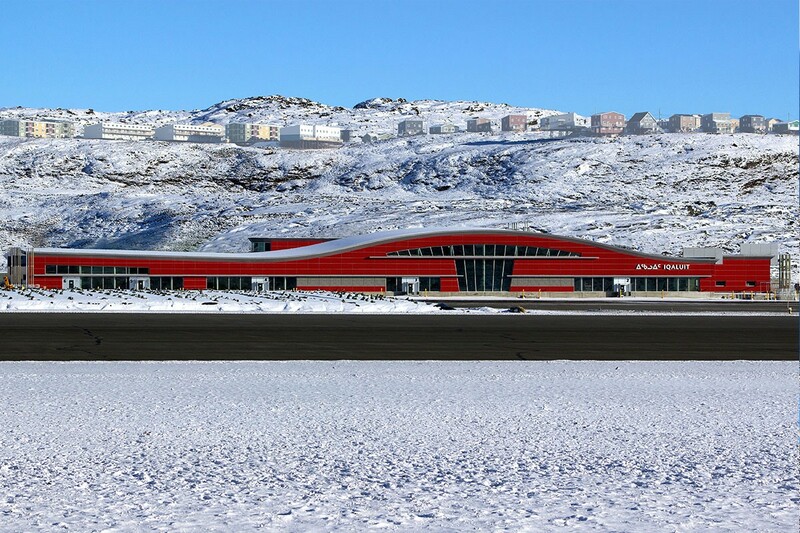 The Canadian province of Nunavut has taken a significant step in this direction with the construction of the new Iqaluit International Airport. The project managers of Stantec Architecture had a fair amount of work to do for this. The airport, which was completed in 2017, is designed for the most extreme of weather conditions. Wind speeds up to 130 km/h and meter-high snow drifts are part of everyday life. A sophisticated, curved roof construction ensures that snow pileups are several meters from the terminal. The construction of a building the size of a soccer field on permafrost was another challenge. The engineers mastered it with a thermo-siphon system under the foundation. Because Arctic winters are dark and energy costs are high, modeling software additionally optimized natural light with the lowest possible window area. Buildings fulfill various functions in the Arctic. Which is why the airport was not only planned as a transportation hub. It is also a meeting place for the locals. The arrival area with seating and restaurants is reminiscent of an igloo. The walls are decorated with works of Inuit artists. Building in extreme climate zones - whether in deserts, in the mountains [link to blog post on Alpine architecture] or in perpetual ice - is a challenge. But it is also an opportunity. Because when highly inaccessible regions are successfully developed, the environment takes on a social significance.